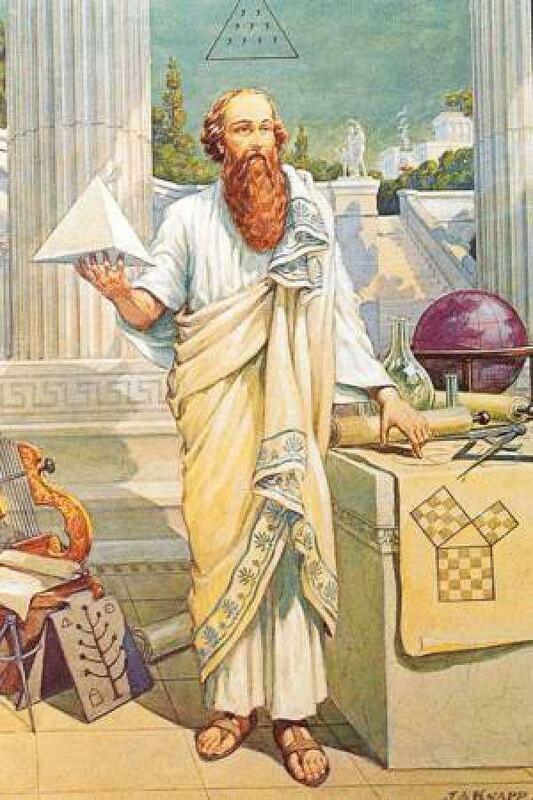 Not much is really know about the Pythagoreans or their rather mysterious founder, Pythagoras. Several different accounts of the Pythagoreans have come down to us from antiquity. 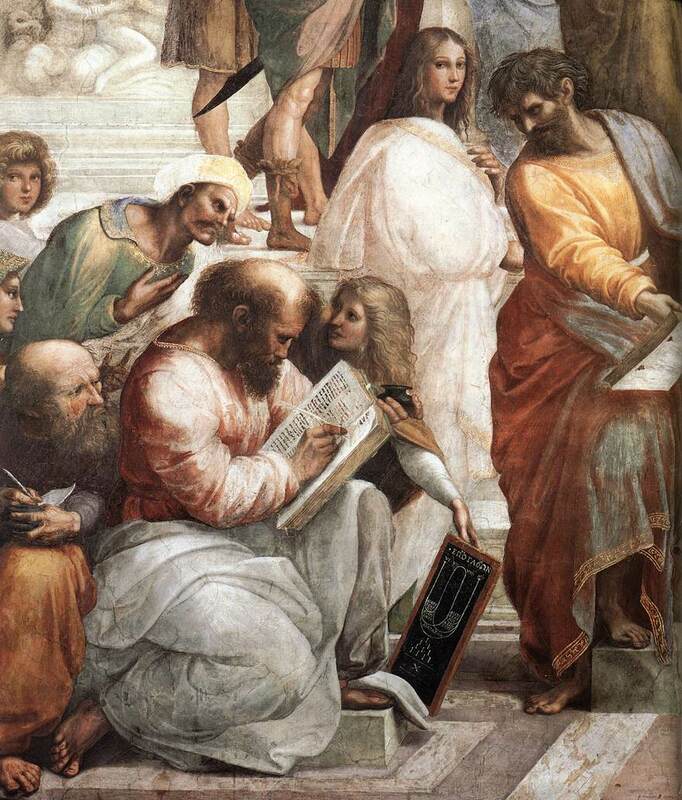 Plato and Aristotle both reference the Pythagoreans throughout their philosophical writings. Even still, the true nature of the “cult of Pythagoras” is often shrouded in mystery. The questions abound: Who were they? Where did they come from? What did they believe? And most importantly, were they a cult? A rather interesting question, don’t you think? Well, I certainly think so. I’ll just assume you do as well. That sort of question is not only interesting, it is terribly complicated. In the context of our modern world, we might consider a group of individuals who worship mathematical harmonies as not only being a cult, but also prime candidates for a straight jacket. 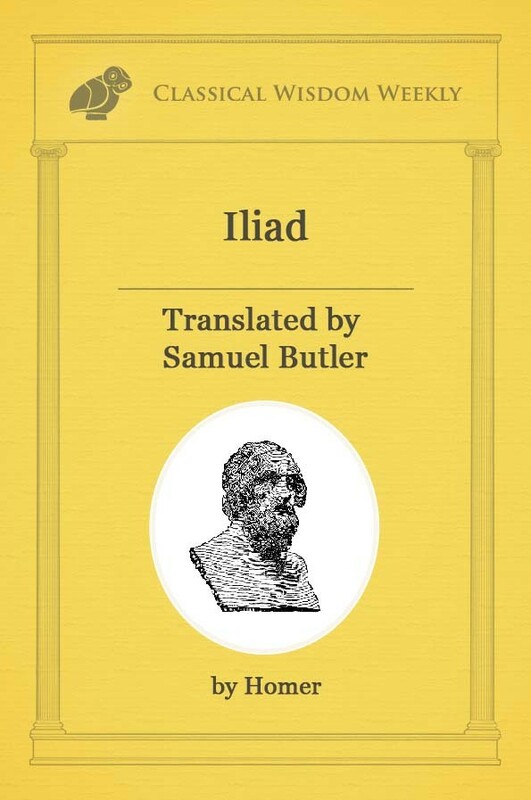 However, in the context of ancient Greece it was not uncommon to attribute great importance, even divine importance, to profound philosophical formulations. that compelled him to pursue true knowledge no matter the cost. These examples, however, do not grant the Pythagoreans a free pass. 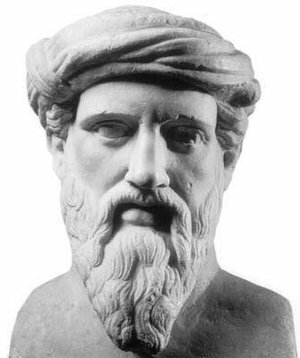 While Socrates, Thales, and others did attribute great importance to their discoveries, the Pythagoreans outright worshipped their philosophical beliefs, going so far as to sacrifice an ox after discovering the 47th Proposition of Euclid. It was said that Pythagoras and his followers settled in Crotona in South Italy around 530 BCE and went about making a society for themselves that reflected their, let’s just call it, unique ideals for life. A central tenant of the Pythagorean belief system was the transmigration of the soul. This included the transmigration of human souls into the bodies of animals. It is perhaps for this reason that Pythagoras strictly forbid the consumption of meat, resulting in his followers becoming some of the earliest known vegetarians. A strange side note of the Pythagorean diet is that they were forbidden to eat beans. The reason behind this is not entirely known. A funny anecdote tells us that Pythagoras believed that a human being lost a part of his or her soul whenever passing gas. They wore a specific garb that was common only amongst their followers. Abstinence of the flesh was insisted upon. However, this seems to have been a later addition. We do know that Pythagoras himself did not die a virgin. 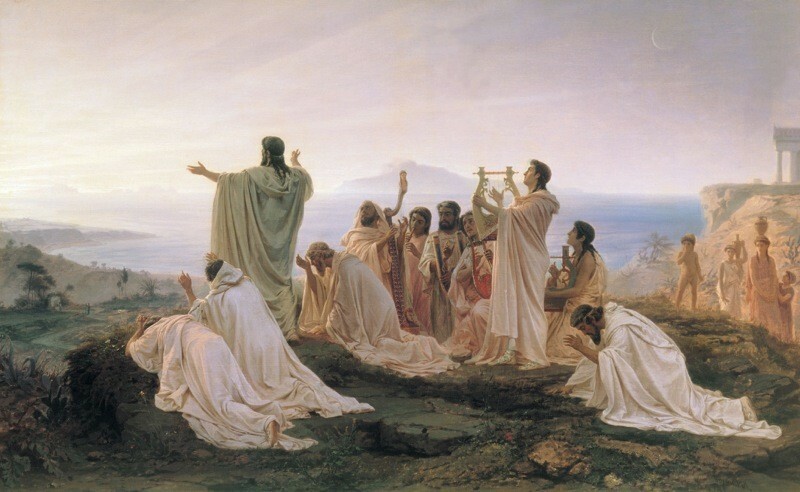 When it came to their philosophical beliefs, the Pythagoreans were extremely superstitious and mystical. They believed that the human soul was trapped in a continuous cycle of death and reincarnation. It was taught that the only way to free ourselves from this cycle was to obtain a higher understanding of the universe through introspective thought and philosophical study. And so when examining the nature of the universe, a rather difficult brand of philosophy known as metaphysics, the Pythagoreans concluded the objects within reality could be differentiated by the qualities that they have. Certain things are different shapes, colors, or sizes. These qualities range dramatically and they are by no means universal. A leaf, for instance, might be green. However, not all things are green, some things in this universe do not even possess a perceivable color. The same can be said for smell, size, or shape. The Pythagoreans concluded that the one universal quality of all things in the universe, the one thing that everything had in common, was that it was numerable and could be counted. We could perhaps imagine a universe without smell or taste. However, the idea of creating a hypothetical universe without numbers is very much impossible. And here we see the basis of the Pythagorean philosophy. They believed that numbers were the underlying substance of reality much in the way that Thales believe water to be origin of being in the universe. However, not all numbers were treated equally. Some were considered more holy than others. 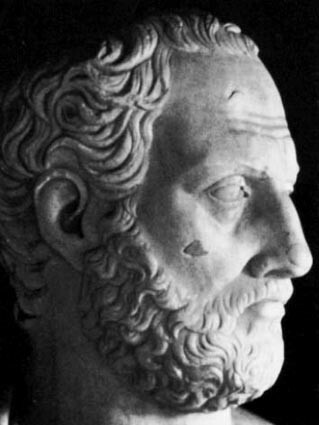 For instance, the Pythagoreans attributed great importance to the number one. This is probably due to their ideas on the formation of the universe. It was proposed that there once existed chaos and disorder within an unstructured, infinite universe. Then, limitations were set upon the universe and the world as we know it fell into order; objects became numerable, the cosmos became perceivable. In this way the universe came from a sort of chaos and took on a oneness that was previously unknown. This idea of a harmonious, single universe would be echoed by the likes of Parmenides and Zeno of Elea. The Pythagoreans paid close attention to the idea of harmonies. They concluded that harmony was a balancing of opposites. The most important of these opposites were the ideas of the limited and the unlimited, which was represented by odd and even numbers respectively. How they arrived at such a conclusion is uncertain. It is believed that since even numbers can be divided by two again and again before inevitably reaching one, they were representative of the idea of unlimitedness. On the other hand, odd numbers cannot be divided by two, and therefore sets a limit to bipartition. In this way they were said to represent the idea of limit. Other opposites included masculine and feminine, right and left, rest and motion, light and dark, good and evil, square and oblong. The Pythagorean philosophy begins to grow drastically arbitrary the more you examine it. They believed that the number eight was meant to represent justice while the number seven represented wisdom. This sort of thinking does not appear to be based on any real philosophical principle and as a result becomes distasteful. All in all, they were a mystical society that placed great importance on the mathematical relations of the universe. There is no denying that they contributed greatly to the area of mathematics and philosophy. One needs only to reflect on the Pythagorean theorem, a mathematical principle said to have been discovered by Pythagoras himself, to appreciate the profound impact they had on the development of scientific thought. Were they a cult? Perhaps. They certainly had all the usual symptoms of being a cult. After living according to their ways for some time, it is believed that the Pythagoreans attempted to pressure the ordinary citizens of Crotona into adopting their unique lifestyle. This, rather unfortunately, did not end well for the Pythagoreans. When the plain citizens were told that they must not eat beans and that they must, at all costs, abstain from eating meat, it was too much to bear. A general persecution of the Pythagoreans occurred. Many of the followers were killed or driven away. 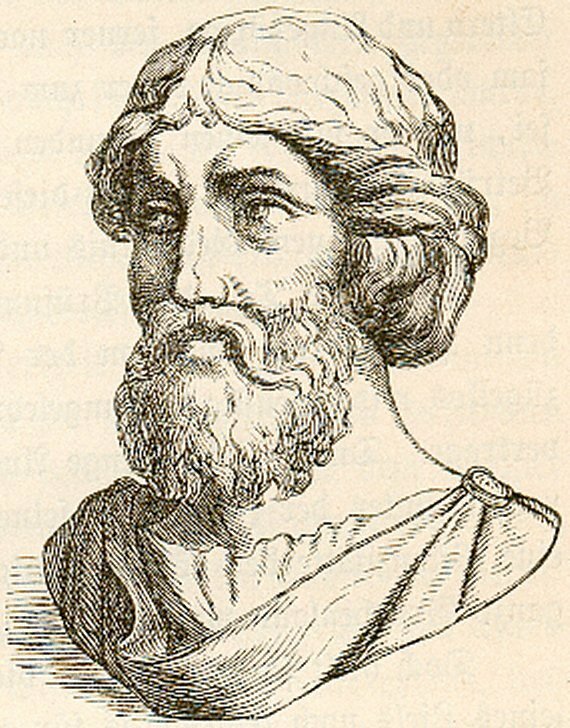 The Pythagorean meeting place was burned to the ground and Pythagoras was forced to flee with his followers around 480 BCE. It is believed that the society regrouped and continued their activities, but not much was heard from them after this time. It is possible that they simply faded away, leaving behind their rather perplexing legacy of mathematical genius tempered with mysticism and superstition. PythagorasAnd here we see the basis of the Pythagorean philosophy. They believed that numbers were the underlying substance of reality much in the way that Thales believe water to be origin of being in the universe. Going to side with the above. Definitely a cult. As usual, you people that are not understanding of such things gloss over many Historical facts. The Pythagoreans, especially Pythagoras, was INVITED, by whole cities to teach and rule their cities in Sicily. So you are quite ignorant of the actual life of Pythagoras, Pythagoreanism and all of the Great Men that sprang from the Supreme Knowledge of PYTHAGORAS… There were many that were led by him, such as Epimenides and others, and Abaris the Hyperborean. You know nothing, and you have a negative attitude of disrespect and insolence, perhaps envy, against the Great Teacher of Teachers, PYTHAGORAS… Any Modern Mathematician will awe a fundamental debt to Pythagoras… The Computers, and Machines that we enjoy today, even the Democracy we live under is thanks to the Greeks, and particularly to Pythagoras since all of the Great masters from Socrates to Aristotle, to Plato, owe everything to Him, to Pythagoras, son of APOLLO….. It is amazing how wise these ancient Greeks were. The parallels with the Jains in the Orient are striking. The Jains Core belief is Ahiisma which means roughly non-violence. Their great founder Mahavira believed in right perception, right knowledge, and right action. The Jains believe truth must be filtered to see if it really is truth. Many of mankind’s inaccurate beliefs contribute to his sufferings. The Jains line -up very well with Socrates’ examination of Truths and goodness. The Jains were also vegetarians based on their affinity with all living-beings. The Jains believed all living things have a life-force, and are sacred. Many of mankind’s Sorrows arise from his attachments to worldly goods, passions, and Sensual Pleasures, thus he develops avarice, and fear due to the attachment to these Worldly Possessions. What was the secret that they kept? While I cannot prove that he was accurate, H. L. Sumner claims that the Pythagoreans had no specific objection to beans in their diet; rather, the beans represented political intrigue. Apparently, beans were used in ancient Greece as a ballot system: White beans represented a yes vote, and black a no. Thus, Pythagoras was urging his followers to not get caught up in politics or government. Seems more plausible than Pythagoras having a bad day at his local Taco Bell. An article spruced with less than averaged interpretations of Platonic Idealism. I agree with Joe, it is advisable when engaging in the interpretation of the great thinkers that shaped the current state of the way we perceive the univrse, to do your background research using legitimate scholary articles. And as for “defenitaly a cult” of course they were. Their venerstion was the universe and its undeniable mathematical composition of perfection. So de we call Christianity a Cult and every other religions system in mainstream society? Does anyone have any links to this information? All of the articles listed at the bottom have broken links or they no longer exist. I’d like to read more on this. Please and thank you! The Religion That Worshipped Numbers | We Seek the Truth! Death by Beans – Eat Your History!